At 8 seconds you see he is plugged into a tweed blues deluxe reissue. On his Vine count, we can easily see that he has this amazing Fender Blues DR. 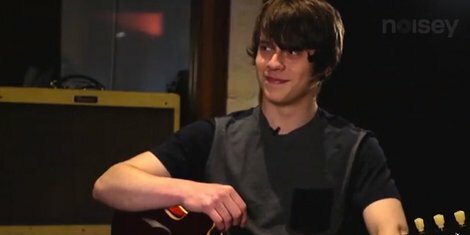 In this shot taken from Jake Bugg's interview with Noisey, we can see he is using the Fender Blues Deluxe Reissue amplifier. You can connect the dots here. Michael's guitar is connected to the same cable that is connect to the Tweed amp just behind him. Check at 0:43. Used on the anthology tour. Mateus posted this photo on Instagram where we can see the Fender Blues Deluxe Reissue Amp. i really enjoy playing through this amp, at low to mid levels the clean is full and warm! the quality of the build seems pretty good, no complaints. it comes with a nice foot switch pedal for your two channels and reverb. oh it has a real spring reverb inside! huge plus! it comes in a bag that is screwed to the bottom of the amp. i wound up taking it out of the bag and just setting it inside the amp for now, ill screw it down soon. my only complaint is that it doesn't have the best clean headroom. this is a 40 watt amp so its absolutely loud. but the clean headroom dies out around 5 on the volume level. I'm pretty sure it just needs a better speaker than the stock one it comes with so ill be swapping that out eventually. I run 2 of these Fender Amps with a Danelectro Reel Echo, splitting the main signal to the left and the delay signal to the right. It gives me a huge splapback sound that comes as close to Gliff Gallup (Gene Vincent) as it gets. I tossed away the amp covers, preferring to get that relic-ed look from night after night of touring. I've busted the cheap input jacks a few times from jumping up on the amps during performance, and kicking the guitar cable jack accidentally. Been wanting to replace the jacks with more sturdy all metal construction jacks... maybe Fender should consider the upgrade. Would gladly have paid a few extra dollars up front for a better quality part. The tone in this amp is completely wonderful and I use it all the time. Amazing clean sound but the max distortion is weak... If you want more just use a TS to give that extra punch. This is a made in Mexico reissue of the great Blues Deluxe amp. This a good amp if you're planning to use the clean channel as a platform then add your pedals of choice to make it scream. The clean here is a typical Fender clean : warm, chimey, intense... and the spring reverb is just.. wow. The are two major defaults in this amp : - The first would be the linear volume knob on the clean channel (makes a huuuuuuge jump of volume from 1 to 2) that can be fixed by changing the pot to a logarithmic one. - The second is the drive channel wich i find to be a disaster. Also, note that it takes pedals like a champ ! 40w keeps up great with the band, and it's size makes it easy to move, and a great choice for gigging. This thing is looooooooooud and I love ittt. This amp is rugged, heavy, and classy. It puts out a loud clean sound and has great features for drive and reverb. If you're up for lugging this around, I highly recommend this amp. I've been gigging with this amp for 5-6 years and it has never let me down. Great, but 2 much treble. When Fender says the Blues Deluxe is an autentic try of bring to this era the early's 50 tweed amps, they're saying the truth. Cristaline cleans, loud af, perfect to mess with the neightbour, but you have to deal with your tone knobs in the guitar to turn off a little bit of the treble boost that this amp have, just like the original tweedies Fender made. Just a fender clean sound. I hate the other useful channel but you can have sustaint with that. fav amp. my current go-to for everything. Great amp with a great sound; it ranges from jazzy, glassy clean to pure rock 'n' roll grit and everything in between. No matter what you plug in or how you set the controls, it never compromises a warm, So-Cal surf vibe that you would expect from an amp like this.